An important idea put forth at the Learfield Intercollegiate Athletics Forum (IAF) is that the overall well-being of a college or university and its student-athletes requires an alliance between the board of trustees, the president and the athletic director. Each December, various stakeholders in the world of intercollegiate athletics gather at the IAF to discuss pressing issues in college sports. Sessions range from one-on-one interviews with conference commissioners to a panel that includes student-athletes. On Wednesday afternoon, Glenn Wong, distinguished professor of practice (sports law) at the Sandra Day O’Connor College of Law at Arizona State University, moderated the session “From the Office of the President: Upholding the Integrity and Ideals of Intercollegiate Athletics” featuring Dr. Renu Khator, chancellor of the University of Houston System and president of the University of Houston, and Dr. Scott Cowen, president emeritus of Tulane University. They discussed their experiences and thoughts on the current state of college sports. There are times when we could all use a fresh start. Scott Cowen was given that opportunity in the aftermath of Hurricane Katrina in 2005, as the then-president of Tulane University in New Orleans. The tragedy led to an institutional soul-searching that would result in a “rebirth” of the university with a new focus on its core mission and strengths. 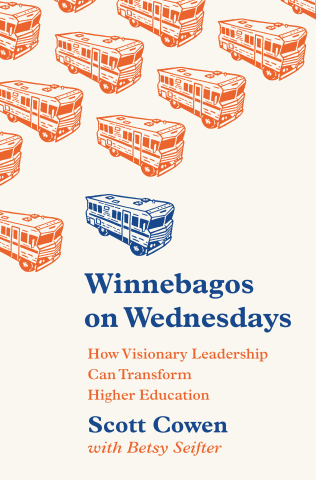 Using that experience as the launching point, Cowen’s book, Winnebagos on Wednesday: How Visionary Leadership Can Transform Higher Education (Princeton University Press, 2018), profiles college and university leaders from around the country who have faced their own transformative moments. In chapters that focus on athletics, medical schools, diversity, innovation and leadership, Cowen shows how today’s university is evolving, and with it, the talents and character of the people in charge. Scott Cowen turned over Tulane University’s presidency to another four years ago, but he never gave up pondering problems facing leaders of higher education. He launched a second book recently entitled “Winnebagos on Wednesdays: How Visionary Leadership Can Transform Higher Education,” and he also writes articles about education leadership for a variety of publications. The Times-Picayune is marking the tricentennial of New Orleans with its ongoing 300 for 300 project, running through 2018 and highlighting 300 people who have made New Orleans New Orleans, featuring original artwork commissioned by NOLA.com | The Times-Picayune with Where Y'Art gallery. Today: former Tulane University President Scott Cowen. In “Winnebagos on Wednesdays: How Visionary Leadership Can Transform Higher Education,” (Princeton University Press), Scott Cowen acknowledges that in many ways, he fits the mold of the typical university president. He's a white male baby boomer with a Ph.D. — like the vast majority of university presidents, according to a 2016 study by the American Council on Education. But Cowen also points out his major points of difference — differences that may have engendered his innovative approach to leadership. The Federal Emergency Management Agency — roundly criticized for its response to Hurricane Katrina in 2005 — has been "much more effective" in dealing with the tragedy unfolding from Hurricane Harvey in the Houston area, said Scott Cowen, the former president of Tulane University who had helped lead rebuilding efforts in New Orleans. "The level of preparedness is better than it's ever been before," he told CNBC's "Squawk Box" on Wednesday. Cowen should know, because Katrina in 2005 flooded 70 percent of Tulane, which forced the university to close for a whole semester. The school suffered more than $650 million in damages.